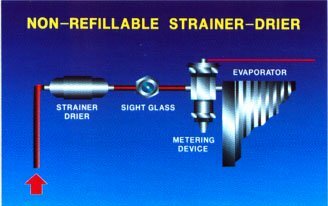 Filter-drier or the filter-drier as it is often called, combines the functions of refrigerant strainer and a refrigerant dryer in one device. This filter is intended for protection of metering and compressor from foreign substances, such as the construction of mud, pipes and solder dross, rust, and metal chips. 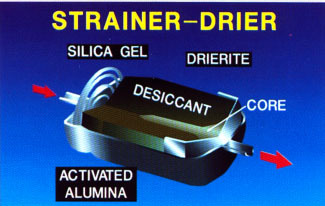 Drier removes moisture from the system and traps, where it will do no harm. The filters must be installed immediately before all devices of the account of all lines of the refrigerant. This prevents particles from plugging a hole in the valve or a house in the valve seat. Many valves include a fine-mesh sieve for this purpose. A strainer is also located upstream of the compressor. Many of refrigerant compressors are equipped with a strainer in the suction chamber, which is sufficient for a normal, copper plumbing. The suction line of the pipelines on compressor is designed so that the built-in strainer can be accessed for maintenance. The use of permanent refrigerant recommended for all systems, and with all refrigerants. Packaged systems of all sizes include filtering and drying device(s) manufacturer deems it necessary. Split-systems and embedded systems, on the other hand, require the selection and installation of appropriate filter(s) and dryers. The disposable filter drier is usually installed in residential and light to medium-duty commercial systems. 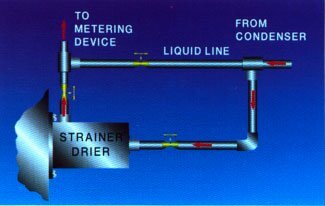 It is placed directly in the liquid line, somewhere between the condenser outlet, and a metering device at the entrance. As shown here, it is often installed in the pipeline, just upstream from moisture, pointing to the sight glass, which is located near the evaporator. Medium and large commercial systems often use the bypass pipeline agreement with replaceable core filter-dehydrator. This mechanism allows the desiccant cartridge should be replaced without interrupting the system or loss of refrigerant. Welded and replaceable core filter-driers are added to the suction line system in which hermetic compressor has burned down. In this case, the intake filter-dehydrator is vital for the removal of pollution created burnout. 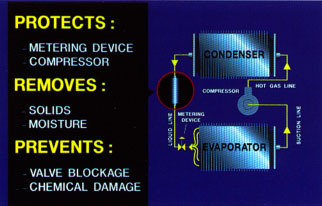 If not removed, these pollutants can damage the replacement of the compressor. Filter-drier as a rule, contains chemical compounds in the core, which serves as a drying agent or desiccant and filters. When a good filter drier is used in the liquid line, no other filter is needed in this line. Among the most frequently used driers silica (silicon dioxide), activated alumina (aluminium oxide), and drierite (anhydrous calcium sulfate). For each substance absorbs moisture, and thus prevents moisture from entering those areas where it can cause harm. Drier unit can strain a very small pieces. 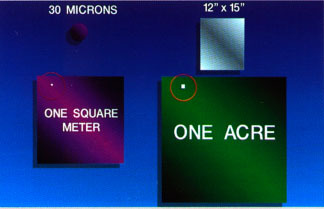 Particles as tiny as 10 to 50 microns in diameter are removed. A micron is one millionth of a meter. Particle 30 microns in diameter would on an area of one square meter, 12 x 15 sheet of paper per hectare of land. Drier very good filter, and for the removal of moisture. 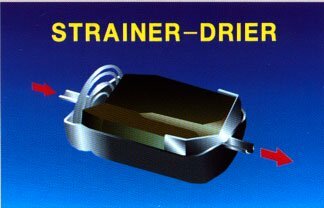 Filter-drier continues to remove the moisture from the refrigeration cycle until it reaches maximum capacity. Beyond that limit, additional moisture will pass through it. It should, therefore, be periodically check and replace. If the filter-dehydrator is connected, it can cause a pressure drop.